Draugr are the ghosts of dead Vikings and dwell in their graves. They possess super human strength and can increase their size at will. They appear from the graves as wisps of smoke and carry the strong stench of decaying flesh. They slay their victims in many ways including crushing them while in their gigantic forms. These monsters enjoy devouring flesh and drinking the blood of their unfortunate victims. Animals that choose to scavenge near any graves occupied by Draugr were said to be driven mad by the control and power of these evil mythical creatures. These entities were said to often come back even after being defeated. Cutting off the heads, burning the bodies and throwing the ashes in the sea were some of the many methods used to mutilate their bodies after defeat. Being absolutely sure these menacing evil spirits were dead and gone was imperative. To prevent the return of dead Vikings, scissors were placed on their chests along with bits of twigs hidden in their clothing. Their big toes were tied together and needles were driven through their feet to keep them from walking again once dead. The popular game The Elder Scrolls V - Skyrim has quite a few undead Vikings lurking about ready to attack. Please check out the video below – contributed by iGamrgeekTV. 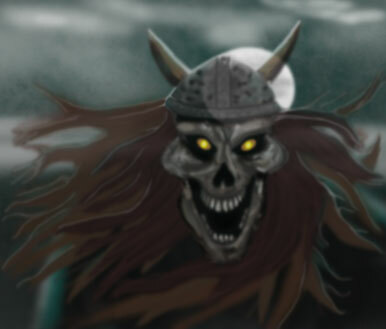 Below is a picture of an evil, angry Viking ghost that has come back to our world to wreak havoc and avenge his untimely demise.